Activision, publishers of Call of Duty and such, will be showing off some new attractions at Gamescom. They’ve provided us with this press release that summarizes it all, reproduced below. Cliff Notes version is this: Zombies in Spaceland (which we told you about yesterday) will be playable on the show floor, or for the majority of readers who don’t reside in Germany, there’ll be a livestream of the new mode tomorrow at 9 AM Pacific, 12 PM Eastern. You can pick Twitch, YouTube or Facebook to watch it on. Cologne, Germany – August 17, 2016 – Activision Publishing, Inc., a wholly owned subsidiary of Activision Blizzard, Inc. (NASDAQ: ATVI), will showcase its latest line-up of leading entertainment franchise releases – Call of Duty®: Infinite Warfare, Destiny: Rise of Iron and Skylanders® Imaginators – at Gamescom 2016 beginning Wednesday, August 17 at the Koelnmesse GmbH Exhibition Centre in Cologne, Germany. Call of Duty: Infinite Warfare: Fans in attendance can celebrate the global reveal of the new ‘80s-themed co-operative Call of Duty® mode Zombies in Spaceland. The new mode takes zombies to a fresh era in a thrilling 1980s themepark setting, sure to frighten and delight zombies’ fans, in a truly unique experience you have to see to believe. Consumers in attendance will discover more at the Sony Interactive Entertainment Deutschland Booth in Hall 7, via an immersive theatre experience that will bring the Zombies in Spaceland game mode to life with some fun, creative and utterly terrifying surprises. Fans can learn more about Zombies in Spaceland by tuning in tomorrow, August 17 at 9:00am Pacific on Twitch at www.twitch.tv/callofduty, on YouTube at www.youtube.com/callofduty and on Facebook at www.facebook.com/callofduty for a special reveal stream hosted by actor Jay Pharoah as he speaks with the game developers in more detail. The Call of Duty fan experience also showcases content from the story campaign in award-winning studio Infinity Ward’s newest title. Call of Duty: Infinite Warfare breaks new ground in storytelling by exploring the weight of leadership and the responsibilities that come with it in an emotional, character-driven narrative. Players are thrust into wartime leadership as Captain Reyes, a Tier 1 Special Operations soldier, takes the helm of the Retribution, one of Earth’s last remaining warships. In a time of unthinkable hardships, Reyes must lead the remnants of coalition forces against a relentless enemy in a war that stretches across our solar system to terrains beyond Earth. Call of Duty: Infinite Warfare introduces new weaponry, unique player abilities and stunning all-new settings to the Call of Duty franchise. In addition to a riveting single player story campaign, and a radical co-operative zombies experience: Call of Duty: Infinite Warfare: Zombies in Spaceland, Call of Duty: Infinite Warfare will also unveil a robust multiplayer mode at the upcoming Call of Duty fan celebration, Call of Duty® XP, in September. Call of Duty: Infinite Warfare is in development for the PlayStation 4, Xbox One, and PC. Call of Duty: Infinite Warfare is not yet rated by PEGI. For more information, visit: www.callofduty.com, www .youtube.com/callofduty or follow @CallofDuty on Twitter, Instagram and Facebook. Destiny: Rise of Iron: Activision and Bungie will unveil the first hands-on gameplay from Destiny: Rise of Iron at Gamescom. 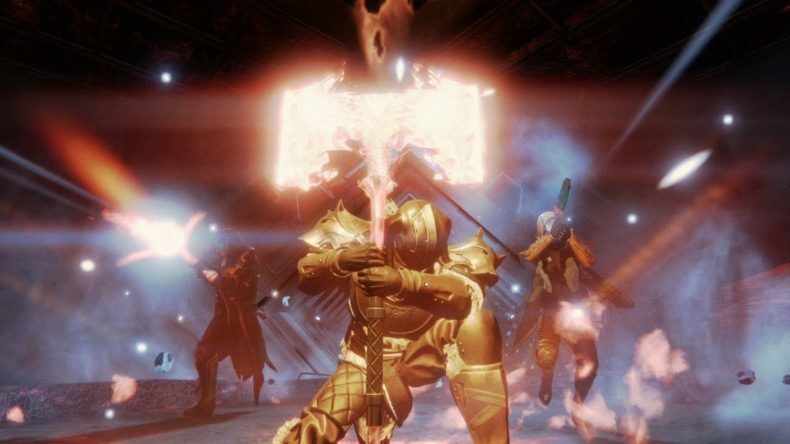 Rise of Iron is the next highly-anticipated large expansion in the Destiny universe. Guardians must rise to the challenge and join forces with a legend from humanity’s past to defeat a plague of unstoppable evil once and for all. Aspiring heroes attending Gamescom will be able to test their PvP skills playing a new competitive multiplayer mode, Supremacy, in Sony Interactive Entertainment Deutschland’s booth in Hall 7. Bungie premiered Destiny’s newest 6v6 objective based Crucible mode, Supremacy, in the studio’s first ever external broadcast, streaming live from Cologne on the eve of Gamescom [Video-On-Demand]. During the stream Bungie also debuted the latest Rise of Iron ViDoc [YouTube] and announced that Private Matches will be introduced to the Crucible, for all PlayStation 4 and Xbox One Destiny owners with the launch of the Rise of Iron on September 20th. To celebrate the Rise of Iron gameplay premiere at Gamescom, Bungie and Activision have also partnered with European streamers to allow fans across the globe to witness the latest PvE content being played live in Cologne. Streamers will be testing their Guardian skills in a new three-player co-operative Strike “The Wretched Eye” which will have them pursuing a SIVA-infected Fallen biologist into a hive-controlled missile silo. The full schedule of livestreams can be found here. On Monday 15th August, Bungie and Activision also announced the launch of Destiny – The Collection. Containing every release from the award-winning first-person adventure franchise to date, including the new large expansion, Destiny: Rise of Iron, Destiny – The Collection is the perfect opportunity for new Guardians to join the fight for humanity’s survival. Destiny – The Collection will launch alongside Rise of Iron on September 20, 2016 and will be available for the PlayStation®4 and Xbox One (PlayStation®Plus, Xbox Live Gold, required for some features). Gamers who pre-purchase Destiny – The Collection digitally will be able to experience Destiny, The Dark Below, House of Wolves and The Taken King immediately, while awaiting the release of Rise of Iron. Activision and Toys For Bob continue to innovate the toys-to-life category with Skylanders Imaginators, the latest chapter in the Skylanders® story, which empowers players to unleash their creativity by creating their own Skylanders. · Crash Bandicoot®: Celebrating his 20-year anniversary, pop-culture videogame icon Crash Bandicoot returns in 2016 in Skylanders Imaginators. Crash Bandicoot maintains his unique and quirky personality as a fully-playable Skylander Sensei and toy. Never one to shy away from danger, the legendary marsupial Crash Bandicoot travels through the wormhole to join the Skylanders in the ultimate battle against Kaos! · Dr. Neo Cortex: Crash Bandicoot’s creator and primary antagonist, Dr. Neo Cortex makes his debut appearance as part of the Skylanders Imaginators line up. Fighting alongside the Skylanders as a powerful mystic warrior, Dr. Neo Cortex puts his dastardly genius to work with his signature blaster ray, hoverboard and explosive mines to thwart Kaos’ forces. He can even summon the powerful Uka Uka mask! In North America, fans who pre-order and purchase the Skylanders Imaginators Starter Pack will receive a playable Kaos Sensei toy for free while supplies last between October 16 – 22, 2016. Skylanders® Imaginators will be available on October 16 in North America; October 14 in Europe; and October 13 in Australia/New Zealand. For more information, visit www.Skylanders.com or follow Skylanders official social channels on Facebook, Instagram, Twitter, YouTube and the newly launched Snapchat channel: Skylanders.